I just re turned from the DARPA Industrial Security Symposium and I have to brag on how fantastic our team did organizing and supporting this highly visible function. Kirk Blubaugh, Sarah Lord, and I witnessed how our folks illuminated the event with the Burn Blue culture every day and every night. The level of professionalism, diplomacy, competency, and confidence displayed by each of our folks as they executed their assignments was amazing. We were told countless times throughout the week how amazing our people are and we could not agree more – the pride we feel is overwhelming! DARPA leadership also cited this as “the best DARPA Industrial Security Symposium to date”. Even more impressive, it was accomplished (preparation to execution) while also managing their day jobs and taking time away from their families. Great team effort – thanks to everyone that contributed! We received numerous accolades from senior Government leaders in attendance on how System High is making a difference in the DoD and IC communities leading to lengthy discussions further validating we are holding true to our mission goals. Our reputation of being the most sought-after provider to solve the most complex protection problems continues to grow. Hand in hand with these conversations were statements that our Proactive Protection (P2) services and methodologies should be the standard for how the entire U.S Government protects our most sensitive efforts. It is going to be a busy summer following up to see how we can best support these customers. Furthermore, I am very pleased with our solid organic growth based on the quality of support provided to the customers we currently serve. Our 505th team is leading the way with a request to almost double the professionals on the program today. Back home, the corporate team has been busy focusing their functional areas towards achieving our company objectives including the assurance of beyond compliance across the business. The team has also significantly contributed to a number of proposals – non-trivial tasks completed in addition to their day jobs. They have done a fantastic job! We still have a number of proposals to submit this year and are always looking for volunteers. Finally, our next PM and Team Lead teleconference is scheduled for May to ensure we are staying focused on our goals and objectives we established at the beginning of the year. If you have any topics you want addressed, please advise your leadership and we will get it on the agenda. Thanks again for all you do to serve our country, our customers, and System High! 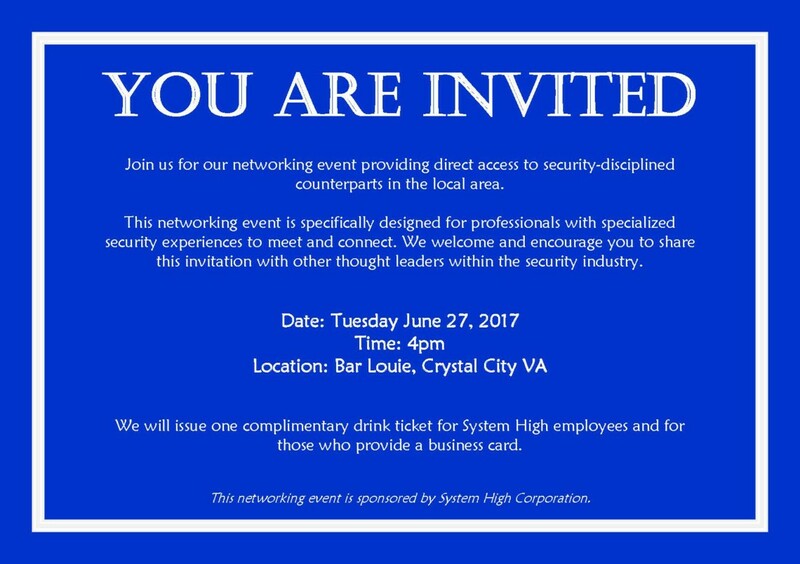 Please join System High in a networking event June 27, 2017, 4pm at Bar Louie in Crystal City, VA. This event is specifically designed for professionals with specialized security experiences to meet and connect. 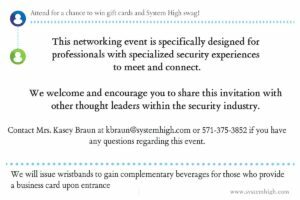 We welcome and encourage you to share this invitation with other thought leaders within the security industry. More details attached. 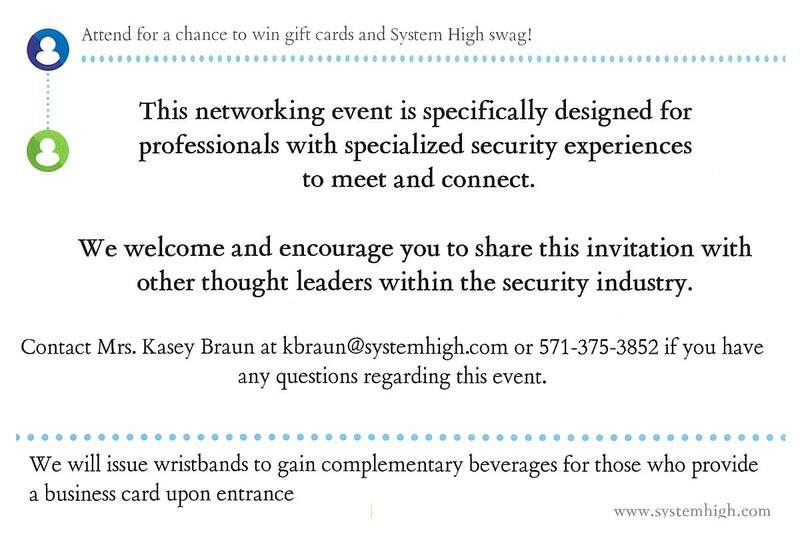 We will issue one complimentary drink ticket for System High employees and for those who provide a business card. 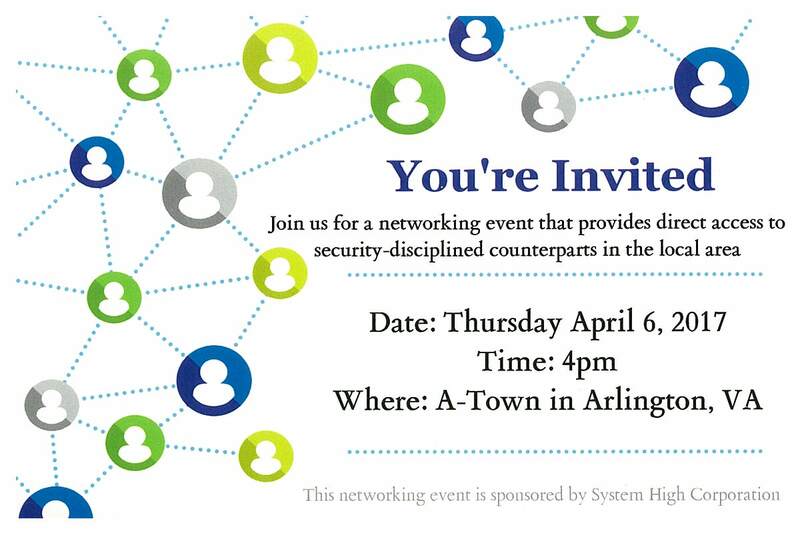 Please join System High in a networking event April 6, 2017, 4pm at A-Town in Arlington, VA.
For those not in the DC Metro area, please know we will be hosting networking events in other locations in the near future. We look forward to seeing you and your guests April 6th! System High is proud to announce the recompete award supporting the Defense Advanced Research Projects Agency (DARPA) Security and Intelligence Directorate (SID). The work entails an overarching spectrum of security services and is performed in Arlington VA and supports hundreds of locations across the United States. 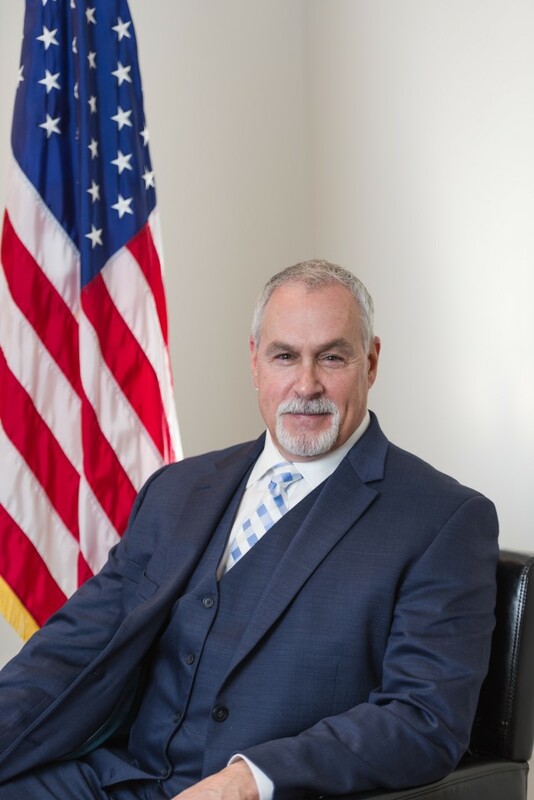 DARPA is blazing new trails in improving protection of breakthrough technologies and according to System High’s CEO, Kirk Blubaugh, it is a privilege to support such an important mission. “From 2012 to the present, DARPA and System High have developed an innovative partnership that continues to strive for “above compliance” services required to preserve the superiority of U.S. capabilities.” Just as DARPA is on the forefront of pivotal technologies, the leadership at DARPA SID and System High are dedicated to developing the most secure environment to deliver uncompromised capabilities to the Warfighter. We are honored that DARPA has selected us to continue as mission partners dedicated to improving our proactive approach to protecting all DARPA programs. This 5-year contract entails a wide range of security and professional services that includes all traditional program security disciplines, Proactive Protection (P2), specialized training, international security and cooperation, Freedom of Information Act (FOIA), Cybersecurity, and Privacy. Services will continue to directly support SID, the Mission Support Office (MSO), and all Technical Offices ensuring support that is second to none to the world’s premier Research, Development, Test and Evaluation (RDT&E) and Science and Technology (S&T) organization. 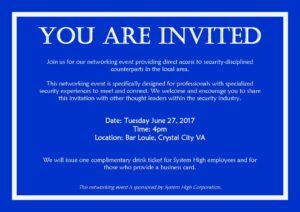 System High Corporation is pleased to announce the addition of Ms. Patrice Siravo in the position of Director, Commercial Cybersecurity. Patrice joins our Colorado Springs office and is primarily focused on helping grow our commercial cybersecurity business. Effectively translating Military grade cybersecurity services, in particular Risk Management Framework (RMF), to the commercial sector requires someone that is respected and known in both worlds and Patrice fits that bill. She brings over 22 years of Information Technology and Cybersecurity experience supporting Government and Commercial space and cyberspace missions as a USAF officer and defense contractor. She is also building robust cybersecurity training that is available now to System High personnel and will soon be available to external customers. We’ve been looking for a highly skilled, proactive Cybersecurity professional to take the lead on numerous Commercial Cybersecurity opportunities. Patrice fits our requirements perfectly and I look forward to her contributions to System High.” said CEO Kirk Blubaugh. System High is proud to announce the award of a subcontract supporting multiple MDA programs at operating locations nation-wide. This 5-year contract entails a wide range of security services including Research, Development, and Acquisition (RDA) Security and Program Protection, Personnel Security, Physical Security, Security Operations Support, Information Security, Classification Management, International Security, Antiterrorism, Insider Threat, Security Reviews, and Emergency Management/Continuity of Operations (COOP). Of special note, System High’s proprietary Program Protection tradecraft known as “Proactive Protection (P2)” was identified as a strength. These services will directly support the critical missions of MDA RDA Programs, including Test and Evaluation (T&E) activities, and fielding of the Ballistic Missile Defense System (BMDS) worldwide.